EDI FlexAir® StreamLine diffuser system is the result of a 100 years of aeration technology, design expertise, and application engineering. 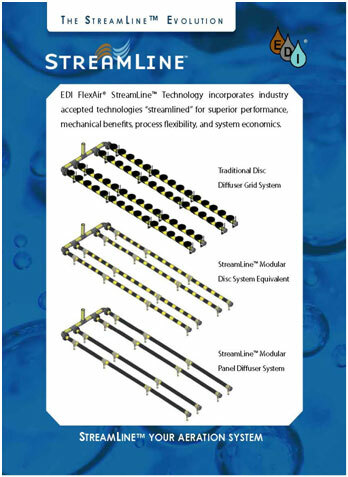 The StreamLine diffuser family includes multiple sizes and arrangements to meet your specific aeration needs. Coupling and integral supports provides unrestricted thermal expansion and maximum mechanical integrity for high load environments including high velocity, high soilds, or mobile media (IFAS). Fully replaceable membrane element and up to 50% reduction in membrane replacement labor.